This fun, useful set contains 2 sizes of our jewelry rolls. They're made completely in your hoop! 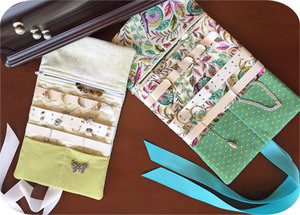 They feature a fully lined zippered pocket with no exposed seams, a ring holder, an earring holder & necklace pockets with chain holder. These strips are made using marine vinyl or other firm no fraying material. We've even included a printable template (PDF) so you get the holes punched evenly in the earring holder! Both are able to be loosely rolled and tied to secure. Roll them up and toss them in your luggage or purse for vacation.